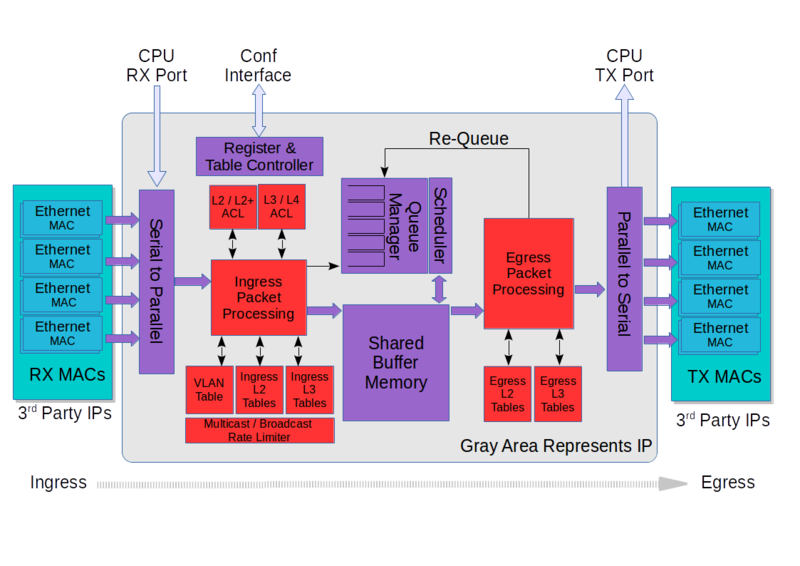 FlexSwitch – a high-performance shared memory switching IP for packet based communication in FPGA or ASIC technology. The FlexSwitch IP is designed to support Switching, Routing and Software Defined Networking (SDN) technology for Ethernet, Fibre Channel, Infiniband and other packet processing technologies. Standard based as well as custom packet processing can easily be developed in the PAC language using a high-level synthesis tool flow while achieving excellent area and performance. Currently available off-the-shelf IP is a complete standard conforming Ethernet L2/L3 switch/router supporting aggregate bandwidth up to 320 Gbit/s in mid range FPGA technology. The FlexSwitch IP is designed to support custom port speeds up to 1 Terabit/s. Off-the-shelf IP supports standard Ethernet speeds of 1 Gbit/s and 10 Gbit/s. Reference design for standard 40 Gbit/s Ethernet is currently being developed. Reference design for 8x10G Ethernet L2 switch using Xilinx Virtex 690T device is available using only a 20% of this devices logic.